When I got married, I was so happy for the first couple of years. They call this the honeymoon period. … luckily…..I’m still very happy! So I didn’t have the typical honeymoon period, it has been lasting for 15 years now! With chatbots, it’s a different story. What are chatbots? A computer program that responds to a person’s questions online with some level of intelligence. For example, a chatbot run through Facebook Messenger that answers your travel related questions. I’m not saying these articles are not correct. What I’m saying is don’t expect to invest in a chatbot now and get the same results in a year’s time. As chatbots are relatively new and most companies haven’t implemented them yet, it’s only natural that users are interested in them. They’ll want to discover what chatbots can and cannot do, and if there is some real weight behind the AI-powered bot hype. So there will be high open and click-through rates for a while. But good things rarely last and the chatbot novelty will wear off. Are you familiar with the Gartner hype cycle? Chatbots are at the period of inflated expectations at the moment. I think we will get to the plateau of productivity or the period of mainstream adoption, but most chatbots will end up in the graveyard before this happens. I have nothing against chatbots and I think there’s a massive potential for a variety of applications, but there are just too many overly optimistic articles about them. 1. Open and click-through rates of chatbots will decline. Look, chatbots are still their early days and people are drawn to new, innovative things. Especially younger generations that are spending more time in messaging apps than on social media. Smart companies will use chatbots to bring their services to customers within platforms that they use the most, like Facebook Messenger, WhatsApp, or Kick. People will sign up and engage with bots because they offer something new. They’ll open messages and click on everything to explore and test their capabilities. But that’s not going to last. As the novelty wears off and you realize that you’ve signed up for too many chatbots, you’ll stop opening all the messages. There are more than 11000 chatbots on Facebook Messenger alone, and new ones are being developed every day. The quality of bots will suffer, and discoverability will become an even bigger issue. All reasons to believe that current usage stats will inevitably go down. Chatbots will still have higher open rates than email for a long time, but don’t expect > 80% open rates! 2. Most of the early chatbots will disappear. 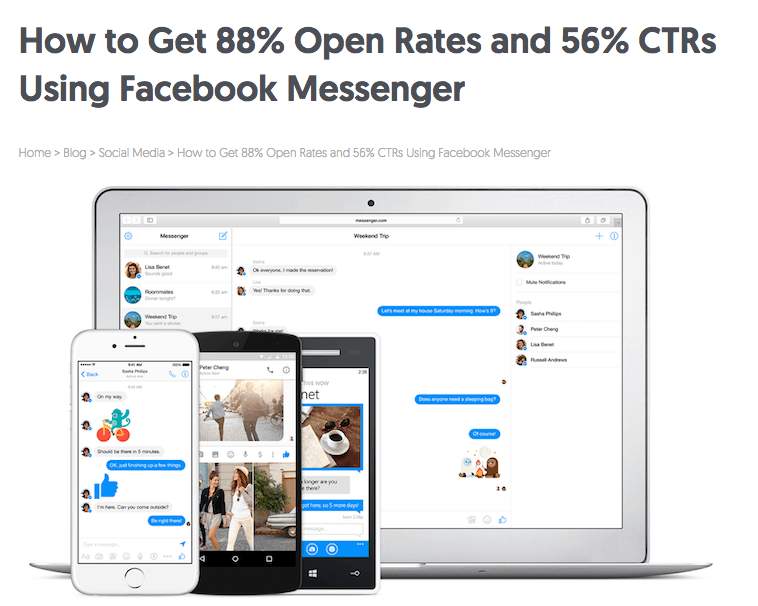 There are tools available, like Manychat, that make it easy even for non-developers to create a Facebook messenger chatbot. Many companies are developing and launching chatbots without a proper use case for them, hoping to capitalize on the conversational UI trend. A large majority of those companies will create something very basic that won’t be particularly useful or engaging. This will give chatbots a bad name. Other companies will launch a bot and won’t bother to maintain it. In either case, most of these early chatbots will perish because they won’t be able to attract an audience. 3. Chatbot providers will disappear. What happens when you build a chatbot using one of the available tools and Facebook decides that too many bots on their platform are spammy? Facebook can switch off chatbot providers and decide they shouldn’t be on the platform. 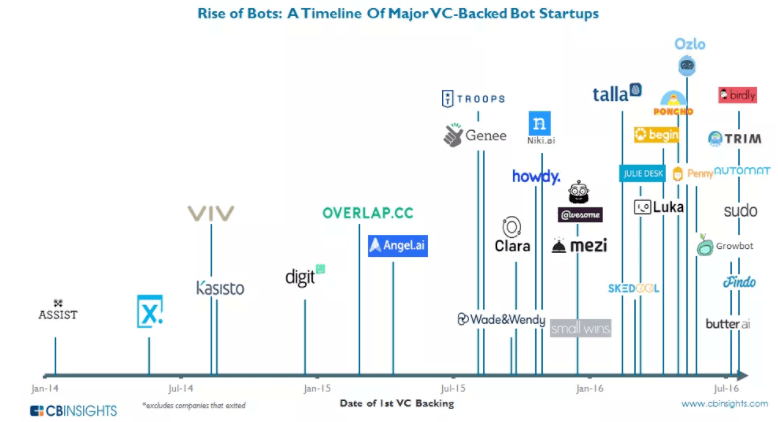 Or what happens when one of the venture capital-backed chatbot startups crash….and a lot of them will crash. If you spent months building a following for your chatbot, you’ll lose it all immediately. 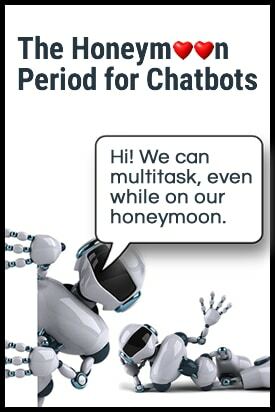 That’s unless you build your own chatbots. There are so many providers starting to build “chatbot platforms” and a lot of them will not survive! 4. If you have a bad experience you won’t come back. According to a report by Publicis Groupe’s DigitasLBi, 73% of Americans surveyed would never come back if they had a bad experience with a chatbot. At the moment, I see people rushing to get a chatbot up and running. Instead, they should be investing time in building a great user experience and designing chatbots that people will love. This is not an easy task which is why so many chatbots fail to provide smart, relevant, personalized, and engaging interactions that today’s users expect. 5. Consumer expectations will not always be met. You ask a chatbot to find you the best flight to a certain city for a specific date and you are delighted with an almost instantaneous answer. You ask about the price and you’re excited to see that the bot found a pretty good deal. You tell the chatbot you don’t want an aisle seat and the chatbot says it doesn’t understand. Disappointed, you decide to go to the website and book your ticket instead. There will be many situations where a bot fails to meet users expectations. That’s why people need to invest time in building smart chatbots and implementing different mechanisms to ensure they can actually understand what the user is asking. When your bot receives a request it doesn’t understand, make sure to provide a fallback message that connects people to live chat support. 6. Consumers will be more concerned with what happens to the data. When you’re chatting with a bot, all this information is stored in a database. If it’s a Facebook Messenger chatbot, it’s likely that Facebook will use this information to target advertisements. What other reason does Facebook have for implementing these bots? They see it as a way of generating more ad revenue. When you start talking about personal stuff and end up getting lots of related ads, this will set off some alarm bells. A customer service expert from Zappos recently said that if chatbots win, customers lose. You can’t beat chatting to a real human, and that’s always going to be a better way to serve your customers if you can have customer service available 24 /7. However, most businesses can’t afford this level of availability. I think there is great potential in chatbots as long as businesses understand they shouldn’t completely take over. You’re stil going to need back up support people when the chatbot is not programmed to deal with a particular situation. I’m certain that open and click-through rates for chatbots will decline consistently over the next couple of years. But I also think that businesses will start to really understand where they can add value. We’ll have fewer but smarter chatbots that will be more purposeful for their audiences. And this is not that bad of a prediction after all!